Background: Temporal arteritis (TA) is a common syndrome in the elderly, consisting of persistent pain in the temporal area of the skull, jaw claudication, sudden visual loss, high erythrocyte sedimentation rate, and tenderness on palpation in the temporal area. The diagnosis of this condition is relatively straightforward when the typical symptoms and a positive temporal artery biopsy are present. However, only half of the patients have a positive temporal artery biopsy. Other diagnostic procedures, such as colour Doppler sonography or superficial carotid artery angiography which have been proved to be useful for the diagnosis of TA, do not discriminate between inflammatory and non-inflammatory temporal artery disease and may be helpful only in experienced hands. Gallium-67 (67Ga) planar scan was reported to be useful in the diagnosis of the disease. 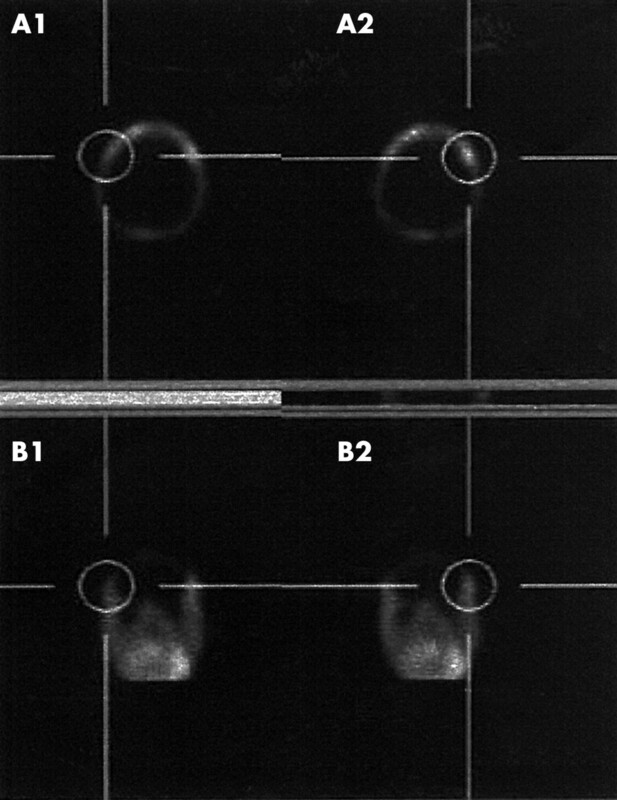 Quantitative 67Ga single photon emission computed tomography (SPECT) may raise the accuracy of the diagnosis. Objective: To investigate the effectiveness and usefulness of 67Ga SPECT scintigraphy in the diagnosis of TA. Methods: Nine patients (five male, four female) and six controls were included in the study. All of them received 8–10 mCi 67Ga intravenously 48 hours before the scan.67Ga uptake ratios were calculated on transaxial and coronal slices. Results: All patients showed increased uptake in the temporal area of the skull compared with controls. Conclusion: The data suggest that 67Ga skull SPECT may be useful in the diagnosis of TA, especially if the uptake ratio in the area of interest is calculated. Further studies are needed to confirm these data. Giant cell (temporal) arteritis (TA) is vasculitis of unknown origin occurring most frequently in the elderly. It usually affects large and medium sized vessels, with a predisposition to the extracranial branches of the carotid arteries. TA is diagnosed clinically. The American College of Rheumatology requires three of the following five criteria to be met in order to establish the diagnosis: age >50 years, new onset of headache, temporal artery tenderness or decreased pulse, raised erythrocyte sedimentation rate, and histology findings.1 Temporal artery biopsy is the “gold standard” test for the diagnosis of TA.2 As the pathological lesion is segmental and localised to some fragments of the artery, the inflammatory lesion is often missed, and in some series normal biopsies have been reported in more than 40% of the patients.3 Additionally, some patients are reluctant to undergo surgical procedures. Colour Doppler sonography and positron emission tomography (PET)4,5 were recently described as useful in the diagnosis of TA, but these observations have not yet been confirmed, and the high cost of a PET procedure restricts its wide use. Gallium citrate binds to the transferrin receptor expressed on the surface of activated macrophages and therefore concentrates in the areas of inflammation.8 Immunohistochemical analyses have shown that monocyte derived macrophages and CD4+ T lymphocytes dominate in TA lesions and express on their surface receptors to HLA-DR, transferrin, and several interleukins.9 Therefore, 67Ga scintigraphy may be useful in the diagnosis of TA. Genereau et al have recently demonstrated increased 67Ga uptake in the temporal area of patients with TA by calculating the ratio between two regions of interest: the temporal region and the control zone in the parietal region.10 In their work they used a planar scan of the skull for calculation. We present here a study whose objectives were to assess the contribution of a 67Ga single photon emission computed tomography (SPECT) scan to the accuracy of diagnosis of TA by visualisation of the inflamed temporal artery. Exclusion criteria included any other known or clinically evident inflammatory or granulomatous disease which might enhance 67Ga uptake in the temporal area, or known allergic reaction to gallium citrate. The control group comprised six patients who underwent 67Ga scintigraphy in the nuclear medicine department of Barzilai Medical Centre in the same period for febrile disease. All the patients underwent a 67Ga SPECT scan, which was performed on a dual head helix gamma camera two days after intravenous injection of 8–10 mCi of gallium citrate. Data were collected on 64×64 matrices with acquisition time 20–25 sec per frame. An Mz-type filter was used for reconstruction of the acquisition data. The 67Ga uptake ratio—temporal bone region/bone out of temporal area (TR/bone)—was estimated on transaxial and coronary slices after SPECT scan reconstruction. For each patient and control, calculations of both temporal areas were made. Results are presented as mean and SD. The mean quantitative values for the groups were compared using the two tailed Student’s t test. A value p<0.01 was considered significant. Fifteen patients participated in the study—nine with TA and six controls. The patients diagnosed as TA showed typical clinical features of this disease such as new onset headache in the temporal area, temporal artery tenderness on palpation—unilateral in six and bilateral in three, and an erythrocyte sedimentation rate above 50 mm/1st h. Four patients had jaw claudication, while six were found to have polymyalgia rheumatica. One patient was admitted to the hospital with sudden blindness in one eye as the presenting symptom of TA. Six of the nine patients underwent temporal artery biopsy—five after a 67Ga scan and one before. In this latter patient the 67Ga uptake ratio of the biopsied side was not calculated (patient No 2) in order to avoid false results. Only one patient showed positive results on biopsy, and in the five other patients the results of biopsy were negative, probably because of prednisolone treatment which was given 4–5 days before biopsy. Prednisolone treatment was introduced before performing a 67Ga scan in seven patients. Table 1 presents the clinical data of the patients. The group of controls comprised six patients who underwent 67Ga scanning because of febrile disease. The mean (SD) age of these patients was 64.4 (25.7), and their mean (SD) erythrocyte sedimentation rate was 45 (13.3) mm/1st h. None of the control patients had headache in temporal areas, none had shoulder pain. All the nine patients showed an increased uptake in both temporal areas of the skull in comparison with control patients. The calculated 67Ga uptake ratio in the patients was 1.47 (0.16) in the coronary view and 1.31 (0.14) in the transaxial view. In control patients the calculated 67Ga uptake ratios were 1.11 (0.06) and 1.04 (0.09), respectively. The results showed a significant difference (p<0.001). 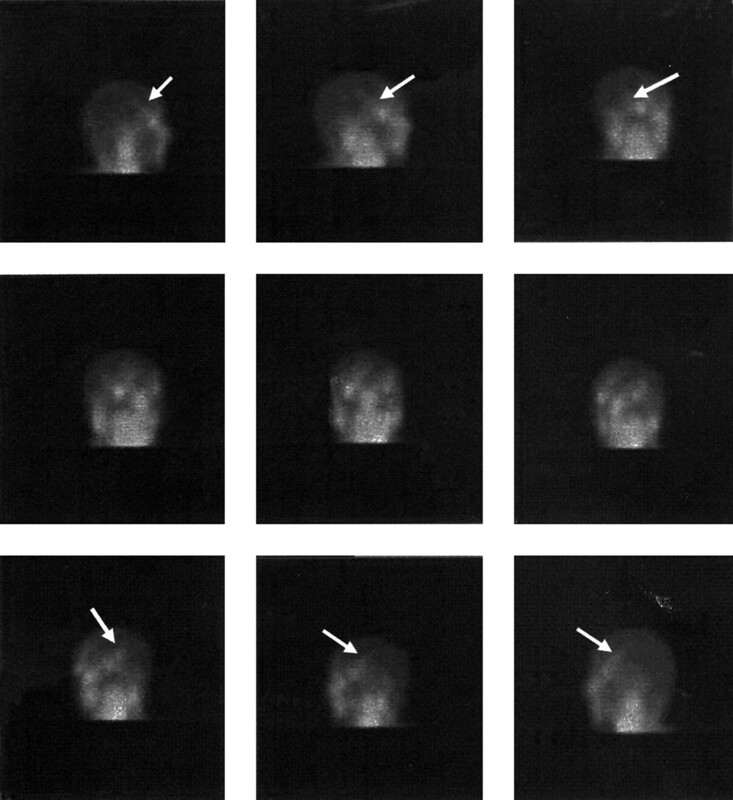 Figures 1 and 2 show examples of increased 67Ga uptake in the temporal area. 67Ga skull SPECT. Transaxial (A1, A2) and coronal (B1, B2) slices. In the circles can be seen temporal artery regions of right (A1, B1) and left (A2, B2) sides of the skull with increased 67Ga uptake. Three dimensional volume cine pictures show increased 67Ga uptake in the temporal regions ( arrows ). The diagnosis of TA is mainly based on clinical criteria and although temporal artery biopsy may confirm the diagnosis, it is not instructive in many cases. There is a genuine need for a non-invasive procedure which may contribute to the diagnosis and follow up of patients with TA. Scintigraphy is a non-invasive diagnostic procedure that may eventually help the clinician to diagnose and localise the vasculitic process. 67Ga is a commonly used agent for the imaging of inflammation because of its ability to accumulate non-specifically in inflamed areas as a metal-transferrin complex, followed by further binding to transferrin receptors. We have demonstrated significantly increased 67Ga uptake in the temporal area of the skull in patients with TA in comparison with control patients. Moreover, all patients showed increased 67Ga uptake in both temporal areas, despite the clinical picture of unilateral process in some patients. SPECT is a method that offers the advantage of cross sectional imaging as compared with conventional planar imaging. Further, computer aided, three dimensional reconstruction of SPECT data helps to make measurements directly in the zone of interest, to obtain a higher image contrast and a clear cut signal of the investigated area. Therefore, the anatomical description of the process is better. In our work after the performance of skull SPECT and further three dimensional reconstruction of the data, we chose for calculation the particular slice of temporal artery anatomical area. It helped us to localise the vasculitic process and contributed to the accuracy of measurements. Despite treatment with prednisolone before 67Ga scintigraphy in eight of nine patients, all our patients had positive uptake suggestive of active TA. Therefore, we suggest that the 48 hours lag time which is needed for realisation of a gallium scan does not interfere with prednisolone treatment and if TA is strongly suspected on clinical grounds, the treatment should be started immediately. In conclusion, 67Ga skull SPECT seems to be a useful non-invasive technique in the investigation of patients with TA. We are aware of the limitations of our study, which included a small number of patients. It may be argued that the low incidence of histological findings typical of TA does not allow an appreciation of the accuracy of this method. However, this is the first study which aimed at clarifing the contribution of 67Ga SPECT scan to the diagnosis of TA. These preliminary results are encouraging and suggest a role of 67Ga SPECT scan in the evaluation of patients with TA. Further studies in larger groups of patients are needed to confirm these data. The authors express their gratitude to Dr Ori Elkayam for her critical review of the manuscript. Hunder GG, Bloch DA, Michel BA, Stevens MB, Arend WP, Calabrese LH, et al. The American College of Rheumatology 1990 criteria for the classification of giant cell arteritis. Arthritis Rheum1990;33:1122–8. Hall S, Lie JT, Kurland LT, Persellin S, O’Brien PC, Hunder GG. The therapeutic impact of temporal artery biopsy. Lancet1983;2:1217–20. Hauser WA, Ferguson RH, Holley KE, Kurland LT. Temporal arteritis in Rochester, Minnesota, 1951 to 1967. Mayo Clin Proc1971;46:597–602. Schmidt WA, Kraft HE, Vorpahl K, Volker L, Gromnica-Ihle EG. Color duplex ultrasonography in diagnosis of temporal arteritis. N Engl J Med1997;337:1336–42. Blockmans D, Stroobants S, Maes A, Mortelmans L. Positron emission tomography in giant cell arteritis and polymyalgia rheumatica: evidence for inflammation of the aortic arch. Am J Med2000;108:246–9. Palestro CJ. The current role of gallium imaging in infection. Semin Nucl Med1994;24:128–41. Front D, Israel A. The role of Ga-67 scintigraphy in evaluating the results of therapy of lymphoma patients. Semin Nucl Med1995;25:60–71. Ando A, Nitta K, Ando I, Sanada S, Katsuda S, Tonami N, et al. Mechanism of gallium-67 accumulation in inflammatory tissue. Eur J Nucl Med1990;17:21–7. Andersson R, Jonsson R, Tarkowski A, Bengtsson BA, Malmvall BE. T-cell subsets and expression of immunological activation markers in the arterial walls of patients with giant cell arteritis. Ann Rheum Dis1987;46:915–23. Genereau T, Lortholary O, Guillevin L, Cacoub P, Galezowski N, Cherin P, et al. Temporal 67 gallium uptake is increased in temporal arteritis. Rheumatology (Oxford)1999;38:709–13. Klaas K, Gregg DC, Sty JR. Ga-67 imaging of “cervical collar” sign in periarteritis nodosa. Clin Nucl Med1994;19:155–6. Matsuura H, Ishikita T, Yamamoto S, Umezawa T, Ito R, Hashiguchi R, et al. Gallium-67 myocardial imaging for the detection of myocarditis in the acute phase of Kawasaki disease (mucocutaneous lymph node syndrome): the usefulness of single photon emission computed tomography. Br Heart J1987;58:385–92. Hahn D, Thomson PD, Kala U, Beale PG, Levin SE. A review of Takayasu’s arteritis in children in Gauteng, South Africa. Pediatr Nephrol1998;12:668–75. Meyers KE, Thomson PD, Beale PG, Morrison RC, Kala UK, Jacobs DW, et al. Gallium scintigraphy in the diagnosis and total lymphoid irradiation of Takayasu’s arteritis. S Afr Med J1994;84:685–8.